The map below is helpful for identifying which communities are associated to a particular school district within DuPage. Click on the map for a detailed view of the DuPage County school system and the included area school districts. A list of DuPage County school districts follows (below the map). 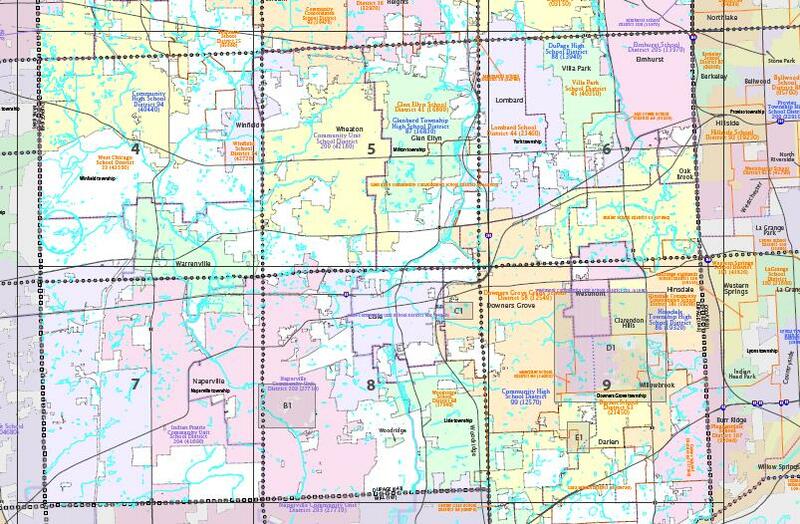 The school district map includes elementary and secondary school districts throughout the county and nearby townships (as some of the school districts actually cross county lines and make up multi-county districts). Though it doesn’t happen frequently, from time to time, the school district boundaries within DuPage County do change. If you have just moved to the area and are trying to determine if your home falls within the boundaries of a particular school district, it is best to check with the school district offices to make that determination. There are some instances when a neighborhood may have more than one elementary or secondary school district.